12. Freddie Mercury Audio Commentary - Taken from archive audio interviews – talking in detail about the specific songs, and recording as a solo artist. 13. Video Directors Audio Commentary – Each video is accompanied by a detailed explanation by the video’s Director. 14. A View Forever – Short documentary describing the creation and unveiling of the Freddie statue in Montreux. Includes interview with the sculptor. 15. The Three Producers – Extended interviews with the three Producers who knew Freddie best – Dave Richards, Mike Moran and Mack. 16. The Last Interview – Last filmed interview with Freddie - unedited. 17. 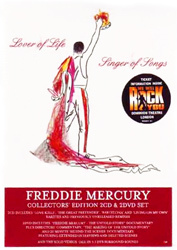 Interactive Photo Gallery [CD-ROM] – Highlights from the Freddie Mercury Photo Exhibition – accompanied by Thierry Lang performance of Freddie songs.